Six months after the 26 December tsunami, which swept away a myriad of futures, many homes still remain crumpled and lives shattered. But amongst the ruins a resolve is growing: next time it will be different. Within both local communities and governments, people are working tirelessly to build a comprehensive tsunami early warning system. There is still a long way to go but the will is rigid and, already, the distance covered is great. "We have made a lot of progress. I think by the anniversary we will look back and think, 'My god, did we really do all that in a year?'" said Robert Owen Jones, climate change director for the Australian government. "On 26 December there weren't any arrangements in place for the Indian Ocean. Now we have the system mapped out, we have lots of plans and money allocated by countries to develop the capabilities. There is no comparison." 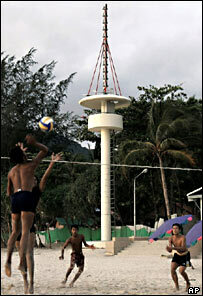 The tsunami early warning system for the Indian Ocean can be seen as a two-tier operation. 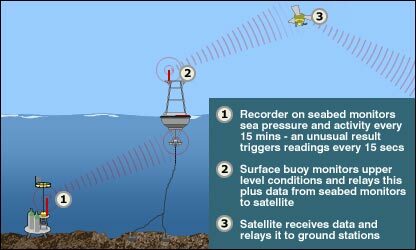 Firstly, there is the hi-tech network of ocean monitoring technology, which will feed back into an international web of early warning centres. And secondly, there is the low-tech community response drill, which will take an emergency warning to every hawker on the beach. The United Nations Educational, Scientific and Cultural Organization's (Unesco) Intergovernmental Oceanographic Commission (IOC) is coordinating the first tier, while individual governments, with help from the International Red Crescent, are handling the second. Both tiers are still in the planning stages, but physical "interim" preparations - both technological and social - are already underway. This week, Unesco is hosting a meeting in Paris to hammer out details for the hi-tech system, which will be shared by 27 countries around the Indian Ocean. Each country is to set up a tsunami warning centre to receive information from the pressure gauges, seismographs and wave sensors that will survey the ocean basin. Many countries have already begun work on their centres. "Today we have a very good number of national information centres for tsunami," said Petricio Bernal, executive secretary of the IOC. "We have 25 in all and in December 2004 we didn't have any. "These centres are helping coordinate emergency preparedness but also warnings for the population." Some countries have gone a step further. On Monday, Thailand opened a hi-tech national disaster centre. The one-storey building in Bangkok is packed with state-of-the-art computer and communications equipment, which will receive information from monitoring centres in Hawaii and Japan, as well as national meteorologists, hydrologists and even the public. "We can broadcast to all TV and radio stations in Thailand," said Col Anutat Bunnag, deputy executive director of Thailand's National Disaster Warning Centre. "Every station will switch from normal programmes to warning centre programmes, and we can send text messages to all mobile phones. "We could warn people within 20 minutes if another tsunami took shape today." Mr Bernal is impressed with Thailand's $1.5m (£800,000) centre. "This is a very important investment by Thailand, I think they are taking the lead," he told the BBC News website. "The centre has the capability for analysing and broadcasting information. They have installed sirens and alarms at beach sites, which are centrally managed." Although Thailand's national disaster centre is currently linked up to monitoring stations in Hawaii and Japan, this will become more localised when the arsenal of alert technology is fully installed in the Indian Ocean. At the moment, several existing tide-gauges are being upgraded so they can fire off immediate information about wave development. 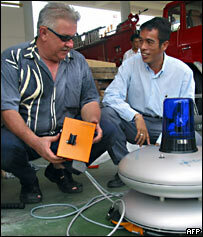 "These upgraded sea-level gauges work in real time to detect changes," said Mr Bernal. "So in other words, they are now capable of detecting the presence of a tsunami after an earthquake." The next stage will be to install a series of pressure gauges - each worth about $300,000 (£160,000) - which sit under the sea and monitor the weight of water on top of them. By 2006, when the whole system should be complete, the Indian Ocean will host several million dollars' worth of equipment. However, according to Mr Owen Jones, cost should not be a stumbling block. "There is a huge willingness and goodwill amongst donor countries to support the system and make sure it works well," he said. "So it is all coming together fairly well." As many have pointed out, all the expensive technology in the world amounts to nothing unless individual countries can prepare their sometimes remote communities. Technology might be the most expensive part of the early warning system, but taking the alert to every fisherman and beach dweller is by far the hardest. Johan Schaar, of the International Red Crescent, says their job has been particularly tough because they are dealing with communities who are so damaged by the last tsunami that living for the present is all they can do. "In many communities, people are living in temporary shelter and they still need to survive day to day," he told the BBC News website. "Mobilising and working through communities that are under such stress is very, very hard." However, the damage caused by last year's tsunami was so catastrophic that a low-tech response chain has already fallen into place, driven by sheer dread. And tragically, it has already been put to the test. In March of this year, another earthquake hit the region, killing hundreds. Although technology in the Indian Ocean was still incapable of predicting a tsunami, many coastal communities did not wait to be told. Officials were quick to spread the word in Indonesia, India, Sri Lanka and Thailand, and thousands of terrified people evacuated their homes. 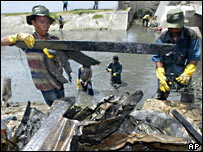 In the end, no tsunami materialised, but the swift response demonstrated that 26 December 2004 will not be allowed a repeat performance. "I have just been to Sri Lanka and the response there was very good," said Mr Schaar. "The government used existing telecommunications systems and the network of police stations along the coast to warn people. It was very effective - people did evacuate fast." The region remains volatile, aftershocks reverberate and many experts believe another devastating tsunami may not be so far away. 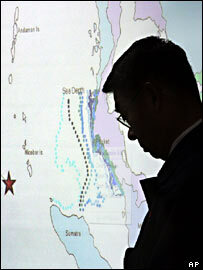 "People are scared about the possibility of another earthquake and they are very much on their toes," said Mr Schaar. "There is a great risk that this could happen again soon. "But we can be confident that people would react differently today."